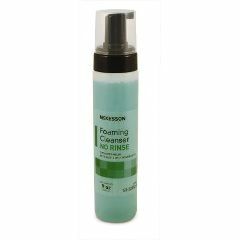 The No Rinse Performance Foaming Cleanser by McKesson is designed for incontinence cleansing. It can also be used a no-rinse shampoo and body wash, as well as a perineal cleanser. This multi-use formula is ideal for those with sensitive skin. It features an easy to use finger pump foaming dispenser. This product contains aloe vera and vitamins A and E to help skin healthy and soft. Pick up a bottle today and try out the cleanser. Each bottle is only 8.5 ounces, so pick up a couple to save on shipping. Check out our other incontinence products and pick up everything you need at once from all the brands you know and trust. Liquid comes out as a foam and addresses a large area without using a large amount of product. great product . just what i looked for. I want to order the Gallon bottle of McKesson's Perineal wash. Is it not available in a gallon?